The Dustin and Stacey Show! : Happy Friday to Me! So I decided to treat myself with a wonderful coffee goodness at lunch. It's been a rough week and I really needed a wonderful, melt-in-your-mouth coffee drink. Look at this beauty! 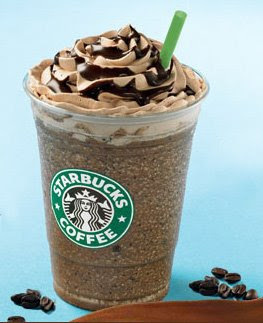 It's a Mint Mocha Chip Frappuccino. Mmmmm!!! Never mind the hundreds of calories consumed! It's Friday and it was needing to be tasted! starbucks should pay you! if the starbucks near to me had mint flavoring, i would've went and bought one after seeing this...i LOVE mint mocha fraps!